The Everyman Bistro in Providence hosts the free outdoor summer concert series at the ALCO buidling. 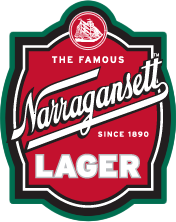 Narragansett beer was lucky enough to sponsor last Thursday’s show with The Agents. The Gansett Girls got to go and had a great time. 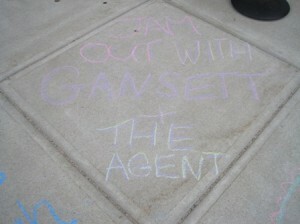 They played the ‘Gansett Hopscotch Game. This is when you have 2 people competing against each other. They must have a full ‘Gansett in order to participate. They each throw the wooden nickel (on any number is fine). Then go down the hopscotch path, skipping over the wooden nickel on the way down, then picking it up on the way back. Your ‘Gansett beer must be in your hand. At the end, the two contestants hold their cups together, and the person who spilled the least amount of beer wins a t-shirt. Just for playing they each got to keep their wooden nickel good for one beer. One thing that can be said about The Agents is that they pay homage to tradition. Whether it’s their name, logo or sound, The Agents give respect to their roots. Jason (vocals, guitar, ) and Dawn (trumpet, bg. vocals) formed The Agents in February 1995. The name came from Jason’s dad’s former band; the original Agents were a Surf Rock, Soul, R&B band in the 60’s. Jason thought it was fitting to continue the family tradition with his band. The Agents’ debut full-length CD on Radical Records, entitled For All The Massive is a grand mixture of Traditional Ska, Reggae, Swing and Surf. The eight members of The Agents bring a special mixture of styles to their sound; very rich, moving, and catchy as hell. One never knows where a song might go, in fact the band doesn’t either since they change lyrics, horn lines and guitar solos as the mood hits. The Agents logo proudly displays the skyline of Providence, Rhode Island, where the band is from. “The small town with the big sound” is how The Agents like to think of their hometown. In fact, several songs deal with living in the city: “98” tells the story of interesting bus rides on the 98 bus line and “Franco’s” is a homage to a local pizzeria where Jason works; “Fatty” calls out a past drummer who reaped more than he sowed from the band, “Gratidao” spins the tale of Jason’s family history, and “Body Snatchers” says a prayer for those friends who drift out of our lives. Guest artists on the album include Vinny Nobile (Pilfers) and Trisha Verdolino (Metro Stylee). Due to their diversity and huge local fan base, The Agents have had the opportunity to play with a variety of bands, including: The Mighty Mighty Bosstones, The Specials, The Amazing Royal Crowns, Pilfers, The Toasters, Inspecter 7, Dance Hall Crashers, Mephiskapheles, Bim Skala Bim, Skinnerbox, Stubborn All-Stars and more.